The original theatrical trailer for Phase IV (1974, dir. Saul Bass). I’ve wanted to revisit Phase IV for years, but for the longest time that proved difficult because the film was not easily available via legal means (as far as I can tell, it was not released on VHS until 2001, with a bare bones DVD following in 2008). It seemed to be one of those movies that was simply lost to obscurity, and that I would have to content myself with the barely-remembered bits and pieces rattling around in my increasingly unreliable mind. Sure, film critic Keith Phipps of The Dissolve recently wrote about Phase IV for “The Laser Age,” his excellent series looking back at the cerebral science fiction released between the late-1960s and early-1980s, but that wasn’t enough to sate my curiosity. If anything, his only piece fueled my desire to actually sit down and watch Phase IV again, which in turn increased my frustration over not being able to even more as it wasn’t easy for me to get my hands on a copy of the film (aside from pirating, of course, but I try to avoid that whenever possible for a variety of reasons). That all changed recently, however, as Phase IV has experienced a bit of a resurgence during the last few years (thanks in large part to the rediscovery of the film’s original, 2001-inspired ending sequence), and it was even added to the Netflix Instant streaming service earlier this month, November of 2014 (over forty years after its initial release). So I sat down to see if I could figure out why this particular movie had lingered in my memory for years, despite the fact that I couldn’t even remember whether or not I ever watched the entire thing. Furthermore, I just wanted to see if the damn movie was any good. I went in fully expecting to be disappointed, but I shouldn’t have worried about that, because it turns out that Phase IV is actually a fairly interesting science fiction thriller that marries the requisite Big Ideas to some striking visuals and a gripping (though somewhat simplistic) story. Phase IV then introduces our intrepid heroes, Dr. Ernest D. Hubbs (Nigel Davenport) and his younger associate, James R. Lesko (Michael Murphy), an “information specialist with cryptological background” who also serves as the film’s narrator. They head out into the desert and discover a series of strange, unnatural rock formations (such as those seen in the featured image of this post), and then later visit a farmer’s field, where they find some dead sheep and a bizarre crop formation that resembles the crop circles often linked to UFO sightings (indeed, interest in crop circles, UFOs, and other pseudoscientific phenomena reached a fever pitch during the 1970s, and this sequence appears to represent an attempt to cash in on the craze). Hubbs and Lesko determine that ants are responsible for both incidents, and they set up a high-tech (for the time) observation station between the desert and the farm where they attempt to make contact with the super-intelligent insects. Meanwhile, the farmer who owns the property refuses to abandon his land, but he and his family are soon tormented by the ants and forced to flee in the middle of the night. They make their way to the station just as Dr. Hubbs unleashes a powerful poison on the surrounding area (a reference to the military’s use of chemical and biological weapons during the Vietnam War, perhaps? ), and the farmer, his wife, and their loyal ranch hand die before they can reach the safety of the futuristic dome. Only the farmer’s granddaughter, Kendra (Lynne Frederick), survives, but this proves to be merely a temporary reprieve as the ants quickly lay siege to the station and begin to conduct their own unknowable experiments on the people trapped inside. This shot from Phase IV appears to directly address cultural anxieties surrounding the use of chemical warfare during the Vietnam War. First and foremost, I think Phase IV could (justifiably) be criticized for being slow, simplistic, and somewhat aimless at times, but in spite of all that it still succeeds on a number of levels. I personally found the film gripping and unsettling throughout, and it contains several sequences and images that manage to be both beautiful and terrifying at the same time, such as the extreme close-up of an ant crawling all over a sleeping Kendra who awakes to find it sitting on her knuckle and coldly staring at her as she meekly whispers, “Please…go away.” Of course, some viewers might find the numerous shots of ants and other insects dull or plodding rather than frightening, but these sequences aren’t necessarily meant to inspire fear in the viewer. Instead, the film uses them to put forth the idea that the true horror does not lie with the insects in and of themselves, but rather in what they represent. In Phase IV, the ants function as an unknowable Other that has emerged not to replace humans, but to reshape them into something other than human. This disturbance of the natural order functions as the source of the true fear in this film, and it represents a common trope in the horror genre, one that stretches back to the earliest days of storytelling (see Noël Carroll‘s The Philosophy of Horror, Or, Paradoxes of the Heart for more on this). Ultimately, Lesko and Kendra embrace that change, but they resist it for as long as they can, afraid to take that final step into an abject unknown. This uncertainty reflects a fairly common or universal fear, and Phase IV does a great job of tapping into that. Thus, I think it unquestionably succeeds as a horror film, even though it is more unnerving than outright terrifying. Another thing really struck me upon revisiting Phase IV after all this time was the realization that while the film aspires to be 2001: A Space Odyssey, it is essentially an homage to the old science fiction and monster B-movies of the 1950s, albeit updated to reflect the attitudes and concerns of the 1970s (which, in many ways, were rooted in the sociocultural concerns of the 1950s). Phipps discusses this in his article, calling the film a “throwback to the animals-on-the-loose films of yore,” and he’s right on the money with that assessment. In particular, Phase IV recalls the classic Cold War giant-bugs-on-a-rampage flick, Them!, in which giant irradiated ants terrorize Los Angeles. Rather than increase the ants’ physical size, however, Phase IV effectively mines horror by increasing their intelligence, and thus the film reflects the rampant strain of anti-intellectualism that Richard Hofstadter contends has defined the national character of the United States since the early years of the 21st century, and truly took root during the tumultuous 1960s. 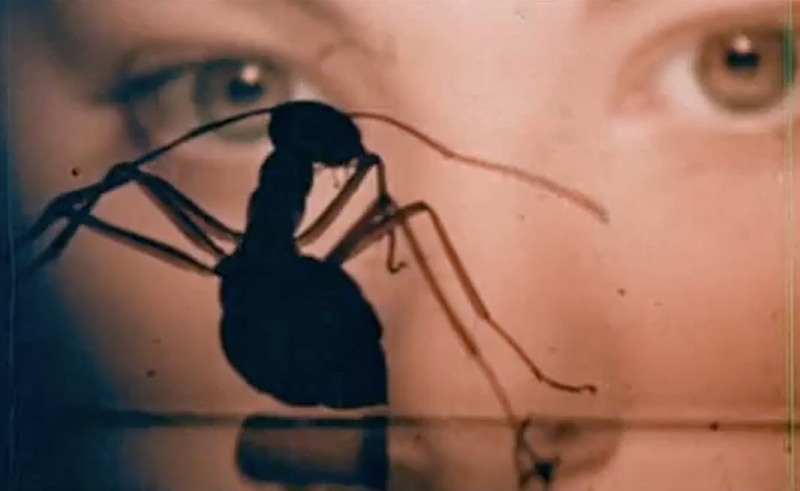 The original theatrical trailer for the classic Cold War giant insect thriller, Them! (1954, dir. Gordon Douglas). At the same time, the film appears to reference all sorts of other Cold War science fiction films, most notably The Monolith Monsters, in which a meteorite crash lands near the remote desert town of San Angelo, California and unleashes an incomprehensible threat upon the world. In addition to the obvious visual parallels between the titular Monolith Monsters and the bizarre structures the ants erect in Phase IV, both films share a number of thematic similarities. For instance, in The Monolith Monsters, a mysterious, unknowable force from space descends upon the Earth, and transforms people into something other than human. Again, these themes and tropes extend back further than the Cold War science fiction films of the 1950s, and they don’t end with Phase IV and similar films from the 1970s. The anxieties that appear in films like The Monolith Monsters, Phase IV, and many others represent universal fears that recur throughout film, literature, and other media. The original theatrical trailer for The Monolith Monsters (1954, dir. John Sherwood). It is entirely possible that the creators of films like The Monolith Monsters and Them! were at the very least indirectly inspired by the writings of H. P. Lovecraft and the other authors who contributed to the overarching Cthulhu Mythos, who were in turn inspired by tales of normal people confronting the unknown. Indeed, Cthulhu and the other Outer Gods all spring from the same sort of storytelling tradition that gave birth to demons, fairies, brownies, and other fantastic creatures, all of which served as stand-ins for things that humans simply could not comprehend. Phase IV continues that tradition but intensifies the fear by demonstrating that despite all our advances in understanding the world around us, some things simply remain beyond our comprehension. More than that, though, the film posits that the universe contains forces that constantly threaten our very humanity, and in spite of our best efforts they cannot and will not be stopped. Ultimately, it’s a shame that Phase IV seems to have been forgotten for so long, because while it may not be a so-called “Great Film” (whatever that means), it nevertheless deserves to be remembered as something more than just an interesting failure. At the very least, Phase IV should be viewed as an effective thriller that aims to explore some big philosophical territory, but ever-so-slightly misses the mark because its reach somewhat exceeds its grasp. Thankfully, more people seem to be realizing that, and the film’s reputation appears to be improving as more people discover it (or re-discover it, as I did). Final verdict: Not essential by any means, but definitely worth a viewing, particularly if you appreciate the sort of heady, thoughtful science fiction that was prevalent during the 1970s (and currently seems to be undergoing its own resurgence in recent years). Next up: Voyage of the Rock Aliens (1984). Previous Previous post: I successfully defended my thesis!